Time sure flies when you're having fun! The Fifty Factor blog was born 6 months ago and this is my 100th post! To celebrate this momentous occasion, I'm having my first ever GIVEAWAY! This is seriously big for me! Never in my wildest dreams did I think I had 100 posts in me. And never, ever, did I imagine, I'd make so many wonderful friends from around the world. My sincere thanks to all of you for your kindness and support these past six months. 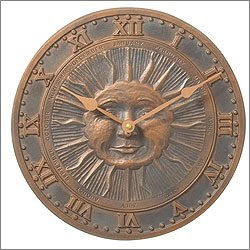 Enter for a chance to win a $50 Visa Gift Card and this beautiful indoor/outdoor Sunface Clock from Teak, Wicker & More! This way, you can celebrate any way you like and keep track of time-- whether you're sipping martinis by the pool, shopping from home online, or kicking back on your patio furniture with your feet up! 1) Leave a Comment on THIS POST or any of my NEW POSTS between now and August 16th, 2009. Each Comment earns ONE entry per post, per person. The more NEW Posts you Comment on, the more chances you'll have to win! 2) Follow me: That'll earn you THREE additional entries. Leave a separate Follow Comment on this post telling me you're a new Follower or, if you're already a Follower, tell me that too-- Either way, you earn three extra entries (max) for Following. 3) Spread the love and blog about "The Fifty Factor Time & Money Giveaway" on your blog and earn FIVE additional entries. Be sure to leave a separate Spread The Love Comment on this post with a linking URL to your blog post so I add your extra entries! Five additional entries max per person for spreading the love. The Fifty Factor is having a great Time & Money Giveaway sponsored by Teak, Wicker and More who carries everything from bird baths to patio furniture. Stop by before midnight, August 16th and enter to win! --Full Contest ($50 Card and Clock) open only to residents of U.S. and Canada. Entries outside U.S. or Canada ARE eligible ONLY for the $50 Visa Gift Card. Sorry, shipping is just too expensive overseas. If the 1st winner is outside U.S. and Canada, a runner up winner will be drawn for the clock. If that doesn't make sense, please email me. --Winner will be chosen at random by me. I'm new at this so please cut me some slack if this isn't the way you would do it. All decisions are final. --Be sure to include a valid email address. --Anonymous comments will not be considered. --Comments will close at midnight PST on August 16, 2009. Winner will be announced here, at www.TheFiftyFactor.com on or about August 17, 2009. So join in the fun and leave lots of comments so you have lots of chances to win the $50 Visa Gift Card and the Sunface Clock! Good luck and thanks again for 6 great months of blogging support! ok, so i'll get on the scoreboard early...and i follow, but you knew that...congrats on 100. looking forward to the next 100.
ok I'm in!! Although I understand about sending the clock to Alaska.... I could send you Sarah!! I am a follower (and a new reader) - nice blog! PS Please keep us posted about the house for sale on your street with the old couple and the white poodle!! Here I am - a commenter and a follower! I can live with just the Visa card....:-) I am coming up to my 200th post - you have set a bit of a precedent here my girl! And hey - my new granddaughter Lily Grace was born this morning. Yay! No need to include me in the give away ...Australia is too far away from most people! I guess it was good that I couldn´t sleep this morning. Now I get a head start on commenting! Oh, I forgot. I am a follower and I am here to stay. Even though I would have loved to win the clock, I totally understand about the postage cost. WOW! I must post alot, I am over 200 and I started in January, but then I am an addict when it comes to this!!! Joanna - Congrats on 6 months! What a nice giveaway. I really enjoy reading your blog and am not surprised that you have so many followers in such a short time! PS - I already follow your blog. I don't want to enter, but I wanted to say congrats!! Brilliant idea for growing your readership! BTW...when I read your post yesterday about your friend, I decided to make today's post "Help a Friend of a Friend" dedicated to you and him. And who doesn't want more time and money? Congrats to you and your post for the 100 mark! Happy 100th post and to many many more. I'm a follower also. I'm down with the gift card. Congrats on 100! Here's to at least 900 more! Yea you! Pls enter me...this clock is AWE-SOME! Congratulations on your milestones! Well done you! Gah, boo, hiss... can't enter as I live in Sweden. But I wish everyone luck! Holy crappola! You look outstanding for 100! Wow! Congrats Snarky One. Just congratulations! I'm in this, but you knew I would be. Congrats J.J. I'm looking for more adventures and mis-adventures with you. Good morning, Joanna. Congratulations on reaching your 100th post. I enjoy your blog and I am a follower/fan. I am new to blog-land, three months, but love it. I have to admit I enjoy reading more than writing, but I am finding my voice. Congrats on your 100th post! That is a very cool clock - it would look great out in my backyard! Congrats on your half-year point and 100 posts. That's quite the accomplishment! 1. I am a new follower. You followed me first and I have no idea what the hell I have been missing lo these past few months. I mean honestly, your blog is quite slamming!! 2. I am leaving a comment to enter the contest. 3. I will, most likely, click on the hyperlink in one of your recent posts that linked to "the eternal hot flash" or somesuch. Because I work with women who are constantly hot flashing and have the AC cranked to friggin 35 degrees. 4. Rock on my fellow blogger!!! I already follow you, so hit me up. You're on my blogroll - that counts as a link, right? PS: That sundial really is cool and I seriously want it. Oh yeah, forgot to be polite and congratulate you on your 100th post. Woot woot! Way to go. I just want to know how you got 143 followers in six months. I feel so lame. Congrats on your 100th post! I'm a newer follower, but I love your blog! wow your good 100 in 6 months. keep it up. Thanks for such a great chance for this giveaway. I already follow you J.
I'm a follower, as you already know. I'm posting a link to this post on today's RTT post as soon as I finish here, like right now! Oh! Like Alix said... you're on my blogroll! Congratulations on your 100th post. Looking forward to many more! I feel a little guilty being entered in a contest for doing something I'd do anyway, but thanks. A little perspective for you. You and I began our blogs at almost the same time. We are both hitting the century mark. You have 143 followers and I have 20. You should be extremely proud of your success here. You've created something very cool. congratulations on reaching your 100th post!! awesome achievement in 6 months of blogging! Oh, wow! I wake up for my morning cup o'blog and the first thing I see is TIME AND MONEY GIVEAWAY!! Woo-hoo!! Did that ever open my sleepy eyes! Well, love, please count me in - I would love to play along! Congrats on the 100 posts, on a great blog, and a large following! Oh, and I follow your blog, too! I'm a relatively new follower, but a follower nonetheless! How fun! I'm so excited! I want in! I want it! I will post about you and your giveaway tomorrow since there isn't enough time today, seeing as how time is flying!! I hope I win, I hope I win, I hope I win!! Sure, I'll hop in on the contest! I love winning stuff. I just hope I can figure out the fine print... follow comment? Humn?? Love the clock and the idea. I'm already following. And screw anyone who dares to tell you that's not the way they would do things. I say a comment like that earns them negative 10 entry points. Here's a comment, I follow you already and congrats on the 6 months and 100 posts! Congrats on your 100th post and 6 month anniv! It's easy to leave you comments as I always do! Great prizes btw. Well done on reaching a century not out! I just love the clock, it would be the perfect Xmas present for my sister. I'm going to mention this on my blog too. Thanks for entering me and Congratulations on your 100th post!! Enjoy the excitement and adventure of your giveaway. You have done a lot of work in 100 posts and your blog is awesome. Congrats on the anniversary! And good luck to us all! wooohooo..i better get my name in the pot!... fabulous giveaway!.. I am a new Follower..and will post a link for your giveaway on my blog...soon as i finish this!... BTW...50's are fabulous! You'll see...oh , how i wish..lol! Loving your site..i'll be back!.. THANK EVERYONE SO MUCH!!!! I appreciate your kind words and your support. Don't forget to keep commenting on new posts through August 16th-- You'll automatically receive an additional entry for each comment. 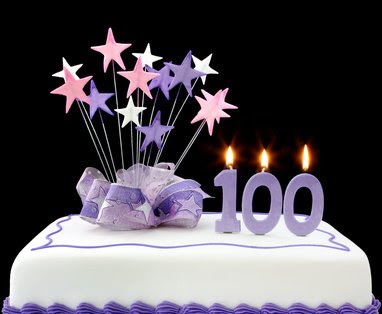 Congratulations on your 100th post Joanna and here is to 100 more!!! I have enjoyed them all!! Thank you. Joanna, on my blog, I said The Boss is SIXTY, not FIFTY!!! Make seven more amazing! Congrats on the 100th post - great work, cool blog! Thank you for your thoughtful, creative giveaway! First, congrats on 100 posts! Second, I'm following you now! Thank you Joanna for the 100 posts. You are a joy to my blog world. Mama told me not to talk to strangers. I'm glad I talk to you. By the way, On Being...is also my blog site and not by another blogger. I didn't want that to be confusing but I guess it was. Thanks for entering!! Now maybe my senior picture will go away! I can't believe it's on your sidebar! Ughhh! 1. Again a new follower here. 2. Leaving a comment to entry again. Which is good because he and I have similair jobs and united we stand and all. Dang, 75 comments before me! I really need that visa card...you read my post about paying a $450 electric bill, right??? Also, I'm totally following you. I would love to be entered in your giveaway and thrilled if I won! How did you get so many followers in 6 months Holy Cow!!! Well Congrats and here is to more good reads! Just checking in to see if you are enjoying your holiday!? ....and also to make some more comments! :) You never know! You are all so GREAT!!!! Thanks for all your kind words and encouragement. @Sassy Pants: I read, comment on and follow a ton of blogs. I comment as often as I have something to say. It starts a dialogue and I've gotten to know some great people. @Betty-- Vacation starts Thursday- I'll be away for 5 days so I'll catch up and comment when I return. But I will be posting so everyone has lots of chances to enter the giveaway! woo hoo! congratulations Joanne! Please write hundreds more. Congratulations on your 100th post. I know how you feel. I never thought I would keep doing this, but I am lovin' it. Ummm... OK maybe two years! Hi! Me again. I just watched the audition video again to bump up the viewing numbers and I've done that a few times. But I thought the numbers would be higher than they are - or am I being unrealistic? Your 100th is proving to be quite a hit! Way to go! Love the clock! Enter me please. I'm a new follower (add engtries please) and I've blogged about your giveaway (add entries please). Great idea! Sorry, you said separate comments...I am a new follower! I have been following your blog for a few months AND I do have you on my blogroll at "A Few Clowns Short". I hope I win, but I'm just happy I found you in the blogosphere. Count me in on this wild ride! Congratulations, I would be delighted to be added for a chance to win. I am a follower too. This is so kind and generous of you! I'm in BC Canada, got here via Selma in the City. Great blog! Wishing you many more blog posts to come! I live in Sri Lanka so am eligible for only part of the giveaway which is anyway very generous. I have linked you to my own blog so please count me in for part of the giveaway! Please include me in on your wonderful giveaway. I am a follower now and will post about your giveaway on my blog. Congrats on your milestone! That clock is fantastic....now I have to buy a house with a sunroom to put it in! Your in my latest post! congrats on 100 posts! Am new to your blog... just wanted to stop by and say hello! Wishing you a lovely Sunday today! Wow - 100 posts seems like a lot, but I bet there are plenty more ideas percolating around in there. Keep up the good work and congratulations on this milestone. Judging from the number of comments this post has generated, I would say you have a lot of readers wanting more posts ! Congrats on your 100th post! That's great! This is my first visit here. Iwant to say congrats on your 100th. I also love that carb tripper and the duck joke had me laughing. Thank you. I admit, I found this blog because of the giveaway. (I love clocks) but I am now a follower. Love the blog!! Congratulations on your 100th post! That takes a lot of committment. Keep up the great work. Great giveaway too! Happy 100th! The clock you're giving away is gorgeous! Thanks for offering such a great giveaway. Please enter me! 100 Posts sure is a lot! Congratulations!! I follow your blog - +3 entries! Enter me in the contest. What a great giveaway! I would be appreciative if I won! Enter me into the contest. This would be awesome to win! Congrats on your 100th! Congrats on your 100th !! That is quite an accomplishment. Great and thoughtful prize. Congrats on 100th. Got my first computer in 1998 when my 2 sons brought a big clunky old thing and plopped it down on my kitchen table as I didn't have a desk then. Lost count of how many posts I have made at various sites over those 11 years but passed 100 a long time ago. Of course blogging was still a bit of a way off back then but still lots of places to post. Sweeps like this barely existed. Dial-up was still the most available service and can still remember the frustrations waitig for a page to load. Grew many a grey hair waiting. Ha! Ha! Was fifty 23 years ago and still going strong and wonder how I ever got along without this contraption that I have sworn at so many times and it still forgives me. Congrats and love the blog !! keep up the great work ! Congrats to you!! I have just the perfect spot for that clock at my house! Enjoy your 100th. May you have many more in the future. Happy Six Month Anniversary and congrats on your one hundreth post. I am new also kind of about 4 months .Better than me at least you have a blog. Congrautlations on your 100th post! This is the first time that I've visited your blog and I can promise you that it won't be my last. Very nicely done. Great contest, and congraulations on the 100th post. wow - what a great prize! Neat clock AND $$$ to spend!! Great contest - that clock looks so nice and would be perfect on a deck or porch. Count me in. I'd love to win! love it! wanna win! :) woo hoo! Congrats on making it to 100 posts!! I have three kids in diapers, so that gift card would sure help out with that. Best Wishes on your 100th!!! Congrats on making it 6 months!!! Awesome. You convinced me, I'm a new follower. I'd love to win the Visa GC and the lovely clock. Thanks for the contest! The clock looks stunning. I hope to win! Makes me think of Aztek sun worship. A solar-centric counter to Vatican geo-centrism! This clock would be perfect for our deck! And who coulfn't use $50! I'm a follower on my Google homepage. congrats - could use some time and money . . .